Novark thoroughly tests its products by performing a variety of in-house reliability tests as well as coordinating with various third-party testing companies, including third-parties specified by customers. These tests fall under three categories: thermal tests, leakage tests, and dimension/cosmetic tests. Each test is performed on all pieces of a customer&apos;s order during engineering validation of a new manufacturing process; some tests are performed on a sampling basis for products in mass-production and manufacturing processes that are well-established. 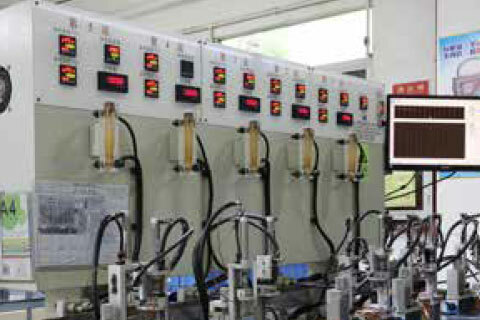 Novark also performs diagnostic tests to determine the point of failure of a product if it fails any of these tests. The thermal performance of a thermal module is its main purpose. Thus, the thermal performance must be thoroughly tested to ensure the product matches a customer&apos;s specifications. For completed modules, this is accomplished by measuring the thermal resistance of the product under heat load, and comparing the module&apos;s performance to verified samples and/or test requirements from customers. However, due to the unique two-phase flow that characterizes heat pipe operation, heat pipes have reliability tests specific to their manufacturing process: the Function Test, the “Qmax” Test or maximum heat load test, the Burn-in Reliability Test, and the Thermal Cycle/Shock/Freeze Thaw Reliability Test. Thermal modules undergo a Thermal Resistance test. The thermal module is placed under 100% of its rated heat load, and the temperature difference between the heat source and the temperature of the cooling medium is measured. This temperature difference divided by the heat load amount is the thermal resistance of the thermal module. If the thermal resistance is within the customer&apos;s specification or matches the thermal resistance of verified samples, the thermal module passes. All thermal modules must pass this test before being sent to the customer. The Function Test is a measurement of how fast the heat pipe responds to a heating load. One end of the heat pipe is placed in a water bath of constant temperature. The other end of the heat pipe has its temperature measured using a thermocouple. The temperature of the heat pipe must rise by a certain amount within a short period of time. If the heat pipe responds within the time and temperature limit, the heat pipe passes. All heat pipes must pass the function test. The “Qmax” Test is a measurement of the stability of the heat pipe operation over the rated maximum heating load. A heater and heat sink are attached to either ends of the heat pipe, corresponding to the evaporator and condenser sections respectively. The heat pipe is then put under a heating load, and the temperature difference between the evaporator and condenser sections is measured. This temperature difference must be below a certain value. If it is not, then the heat pipe fails this test. All vapor chambers and flattened/Ultra-Thin Heat Pipes undergo this testing. A sampling of about 3% of a mass-produced batch of round heat pipes is tested this way due to the high production volume, but for new processes all products must undergo this test. The Burn-In Reliability test or Accelerated Aging Test is a measurement of the heat pipe&apos;s ability to resist performance degradation at high temperature and pressure. The entire heat pipe is heated to a high temperature that raises the internal pressure of the heat pipe by a considerable amount. The heat pipe stays at this temperature for an extended period of time. After this, the heat pipe is allowed to cool. The “Qmax” Test and Function Test are performed again to see if the thermal performance has degraded. If the degradation is minimal, and the heat pipe diameter has not deformed, and the temperature difference between the evaporator and condenser is less than a designated amount, the heat pipe passes this test. The time and temperature are higher during engineering validation, but the criteria are just as strict. 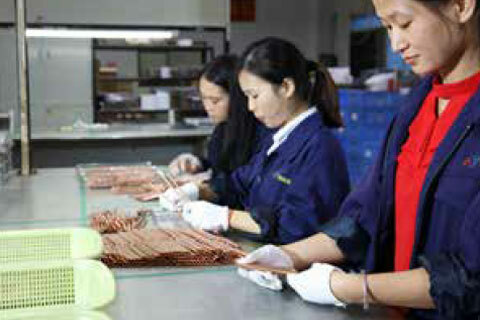 During mass-production, all heat pipes are tested at lower temperatures and times. The Thermal Cycle/Shock/Freeze Thaw Reliability Test measures the heat pipe&apos;s ability to withstand extreme swings of temperature over a period of time. The heat pipes are heated then cooled between two temperatures at the edges of their rated operating range, and are cycled between hot and cold for a period of time. For the “Shock” version, the temperature change is rapid and the shifts happen every few minutes, repeated well over 200 times; for the “Cycle” version, the temperature shift happens over a full hour, and the time spent at each high and low point is also an hour, with only ten or so cycles. Once the testing is complete, the “Qmax” and Function tests are performed again and the diameter is checked again for deformations, to determine if the thermal performance and geometry has degraded past a minimum value as a result of the rapid cycling. Customers can specify the variables for this test if Novark&apos;s default specifications are not adequate. This test is performed on all heat pipes during engineering validation, but is only performed on a sampling basis during mass production. A heat pipe is charged with a working fluid. This working fluid must remain within the heat pipe in order for the heat pipe to function. In order to ensure that the working fluid is not leaking from a heat pipe, the integrity of the pipe is tested in a variety of ways: the Burst Test, the Air Leakage Detection Test, and the Leakage Rate Test. The Burst Test measures the mechanical strength of a heat pipe&apos;s walls by subjecting them to high temperatures for only a few minutes. This raises the internal pressure in the heat pipes as the working fluid expands due to the high heat. Once this is done, the heat pipes are examined for any ruptures from the increased pressure. If there are no ruptures, thermal tests are performed again to see if the heat pipes still operate as they should. This test is carried out on all heat pipes during engineering validation, but is only performed on a sampling basis during mass production. The Air Leakage Detection Test measures the integrity of the seals on a heat pipe by applying an external pressure to the heat pipes for 2 hours. After this is done, the heat pipes undergo thermal testing to determine if the thermal performance has degraded because of air leaking into the heat pipes. This test is carried out on all heat pipes, for both engineering validation and mass production. The Leakage Rate Test is a new test that will be integrated into Novark&apos;s testing regimen. This test measures the rate of leakage of the working fluid from a heat pipe, to determine the shelf life of a heat pipe. The heat pipes are placed in a pressure vessel that is then filled with helium at high pressure for one hour. The heat pipes are then removed, and placed in a helium detector. Due to the small molecule size of the helium, it is expected that some helium would enter the heat pipe; however, the rate that the helium leaks back out of the heat pipe is what is measured. The heat pipe passes if the leakage rate is below a minimum value specified for each design. This test will be performed on all heat pipes during engineering validation, but only on a sampling basis for mass production. The thermal module must maintain its shape and condition where it will be installed. Thermal modules must also be resistant to corrosive conditions. Not only does Novark check the geometry of its products using go/no-go gauges and flatness gauges; Novark also tests the cosmetic integrity of its heat pipes using the Surface Deformation Reliability Test for vapor chambers, and the Temperature and Humidity Cycling Reliability Test and the Salt Spray Reliability Test for all heat pipes. The Surface Deformation Reliability Test is unique to vapor chambers because they are flat, thin, and wide, which could make them vulnerable to deforming under high heat load. The vapor chamber is subjected to a high temperature and heat load for a period of time. The vapor chamber is then allowed to cool, and is checked for deformations from the thermal load. All vapor chambers undergo this test during engineering validation, but this is only performed on a sampling basis during mass production. 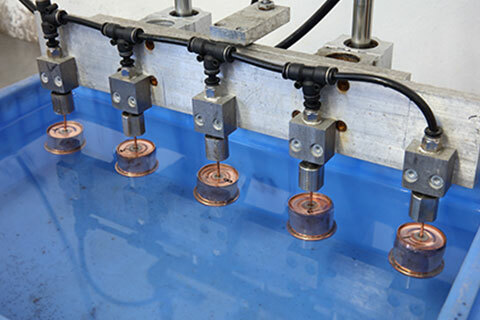 The Temperature and Humidity Cycling Reliability Test measures the anti-oxidation performance of the surface treatment of a copper heat pipe while under a thermal load. The heat pipes are subjected to a temperature load at high humidity for a period of time. After this test is conducted, the thermal performance is re-evaluated and the surface is checked for oxidation. If there is no oxidation and the thermal performance does not deviate beyond a specified amount, the heat pipes pass this test. All heat pipes undergo this test during engineering validation, but this is only carried out on a sampling basis for mass production. The Salt Spray Reliability Test measures the anti-oxidation performance of the surface treatment of a heat pipe by spraying a saline solution continuously on the surface of the heat pipe for a period of time. If no oxidation appears as a result of the continuous salt water spray, the heat pipes pass this test. All heat pipes undergo this test during engineering validation, but this is only carried out on a sampling basis for mass production.